Urgh – Mondays! Even the word feels us with dread. Mondays are known the world over as being depressing, tiring, busy, and all too far away from the next weekend. Indeed, many people dread Mondays so much, that they feel anxious about it on a Sunday night. This is known as the ‘Monday blues’ and causes a lot of people anxiety and feelings of sadness. Another side effect of the Monday blues is feelings of unproductiveness. Due to being tired from the weekend that just went by, a lot of people feel Mondays are just for coffee and procrastination. But should we change this? If you get everything ready on a Sunday night, it makes Monday that bit easier to endure. Iron your clothes ready to put on, wash your hair if you need to, and make up a lunch box ready. These are key tasks that usually take up time in the morning! Fruit has many benefits, but recently Fruitful Office discovered in a study that many people feel more productive at work after eating fruit. In fact, it has such a great impact on workforce that many employers are buying fruit to give to their employees as snacks during work hours, just to improve productivity. So much better for you than a biscuit and a coffee! Whether it’s the latest episode of a series you are watching on TV, a themed dinner night or simply a relaxing bath and a book, have something planned for Monday night to reward yourself. This post on Forbes suggests writing a list of three things you are looking forward to at work that week. This might put you in a more positive mood. If you can’t think of three things you look forward to, that might be an indication that you need to make some changes to your routine. Work doesn’t have to be dull. Take it upon yourself to do things that you enjoy in the office on Monday. Perhaps you could bring in some healthy snacks for your colleagues, or take a lunchbreak with a friend and have a catch up! If you already have it in your mind set that you’ll be depressed come Monday, you probably will be. Think positively. Embrace the week ahead. 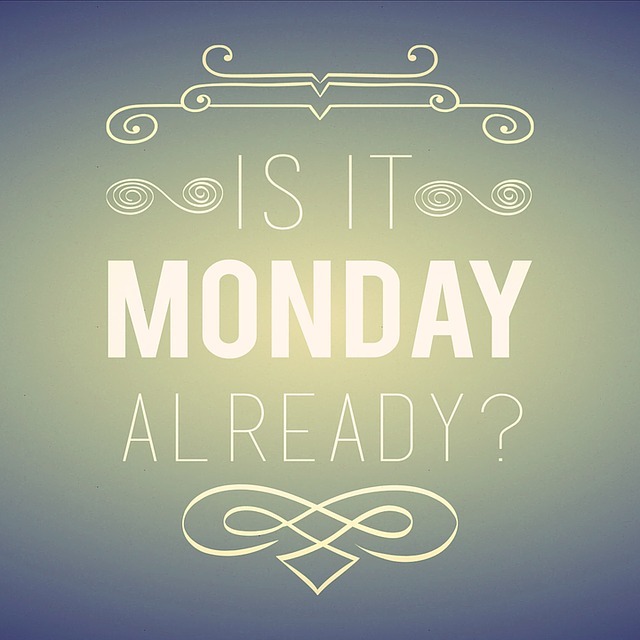 Yes, Mondays can be drab, but it’s only one day – 8 hours at work, so it isn’t the end of the world. It will soon be Friday again!